Excavators have long been worksite staples in the construction, mining, and forestry industries, and for good reasons. These machines are popular choices due to their power, maneuverability, and versatility. Whether you’re looking to add one new John Deere excavator to your ensemble, or to upgrade your entire fleet for enhanced performance, we have some helpful guidelines for choosing the excavator that will best fit your needs for years to come. Size is an extremely important consideration when selecting your new excavator. After all, the size of the machine determines its workload capabilities and the type of storage you will need to protect your equipment from damage and possible theft. Compact excavators are the smallest available and range in size from 1,750 to 6,600 pounds. Compact excavators are ideal for small construction areas, light excavation work, and confined spaces that could otherwise damage larger excavators. 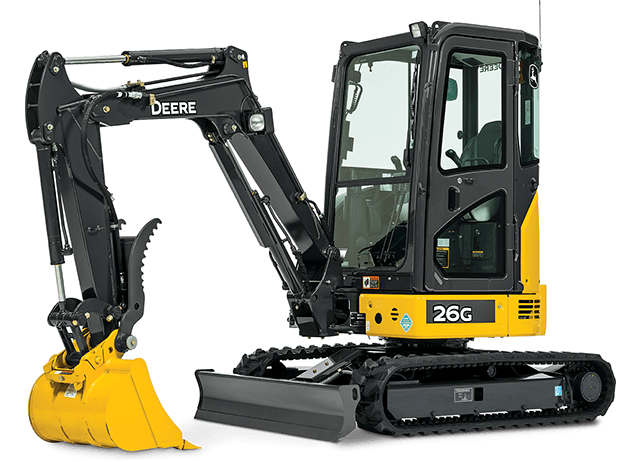 Standard excavators are typically 22,000 to 88,000 pounds (10 to 40 metric tons) and are best suited for typical excavation jobs with no confined spaces or possibility of damage to the machine. Large excavators range in size from 88,000 to 155,000 pounds (40 to 70 metric tons) and are ideal for the most demanding jobs. There are many types of excavators on the market, including crawler excavators, wheeled excavators, and long-reach excavators. Crawlers are the most common type: they move on steel tracks or rubber tracks as opposed to wheels and offer increased stability on uneven and difficult surfaces. Long-reach excavators are named for their extra-long boom, which allows operators to reach extremely tall trees and multi-level buildings. Zero-tail-swing or reduced-tail-swing excavators, like the John Deere 26G model, are best for working in tight, confined spaces or spaces with obstacles due to its enhanced flexibility and 360-degree rotation. Before buying a new John Deere excavator or a used excavator for sale, it’s important to examine your typical working conditions. Consider whether you will need your excavator to dig, reach, lift, or carry rocks. Determine whether your work sites will have tight, cramped spaces, or expansive areas free of obstacles. A compact excavator may be better suited for construction work, as the machine can easily maneuver between buildings. Likewise, a large excavator is ideal for industrial or more demanding work. Choose a machine that has air conditioning and heating inside the cab for operator comfort and increased productivity. If your machine will be battling snow and ice, you should also consider the necessary storage to protect your equipment and keep your job site running. Operator comfort is key, which makes features like AC, heating and comfortable, adjustable seats important. Additional features like enhanced visibility, a quiet cab and machine, and a cab that is spacious and easy to get in and out of promote operator safety as well as comfort. To assist with regular maintenance and inspections, choose a model that has easy access to the engine and hydraulic systems. If possible, test out the John Deere excavator before purchase to ensure that these features meet your needs. Attachments are just as important as the excavator itself and are available on both new and used excavators for rent or sale. Determine which attachments you will need to ensure they are available and compatible with your new John Deere excavator. Papé’s Worksite™ Pro Attachments provide flexibility and diversity for your work site through some of the most popular and versatile attachments available for your compact excavators. Choose from buckets, thumbs and portable crushing buckets for lifting rocks or pavement removal, hydraulic hammers for demolition, augers for drilling, rippers for breaking through tough materials, rotary mills for soil stabilization, and rotary tillers. Sometimes you want more than the standard model, and that’s ok. Some of the more widely available support features include a monitoring system that will perform diagnostics to detect signs of malfunction before they become a problem, pilot hydraulic controls that enhance machine operation, and power modes that allow the operator to distribute different power levels to attachments. Another option to consider if security is a concern is an anti-vandalism system that locks the excavator and prevents it from being used or stolen. Excavators are extremely important workhorses for a variety of tasks and worksite environments. Whether you choose a standard model or an excavator with enhanced features and attachments, your new equipment is likely to become the most indispensable machine in your fleet. Check out our new and used inventory of John Deere excavators and visit us at any of our locations across Oregon, Washington, California, and Nevada. Trust us to keep you moving.